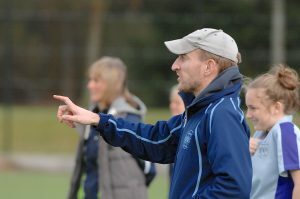 IT’S A FINE line between winning and losing, but for Woking Hockey Club ladies coach Mark Robinson, he believes he has the answer, writes Andy Fitzsimons. With Woking Ladies 1s needing at least one draw from their remaining two division one fixtures against Reading 1A and Wimbledon 1A to potentially avoid relegation, Robinson is calling on some big hitters in the world of sport for a bit of assistance. conditioning play a critical role in changing or defining the outcome, so who better to call upon than the likes of a few cult heroes. In a bid to combat any last minute nerves, Robinson is now leaning on some proven neuro-linguistic tactics to prepare his players. He has pulled together a three-minute motivational video, which will be screened to his players in the dedicated player room prior to them taking to the pitch against Reading on Saturday (18 March ’17). He said: “The Reading fixture is a must-win game, plus it’s our last home game of the season. “I have used motivational tactics before when I was at Havant Hockey Club, so I feel it will appeal to the players and, most importantly, get them in the right frame of mind. “The quotes used within the videography have been taken from several American sportsmen and women who were all winners on the court and key leaders off it. “I have been lucky enough to work with and learn from some exceptional mentors myself, with Sue Perry at Sussex Hockey Club possibly being my first mentor and from whom I learnt so much. “Outside of the game, I have always been inspired by the words and wisdom of big personalities, such as Michael Jordan and Winston Churchill – to name just a few – through their respective leadership and motivational skills. “It’s all about finding out what makes people tick to help bring the best out of them,” he added. While Woking’s current league position belies their work-ethic on and off the pitch, Robinson believes that one final push will help his players over the line and preserve their division one status for next season. And with rivals Staines only one point ahead of Woking in the table – but with a far inferior goal difference – Robinson’s players are well placed to take advantage of the situation if they can prepare themselves effectively.